Also referred to as the MCL, the medial collateral ligament is a major ligament that contributes to the overall stability of the joint of the knee. Along with three other knee ligaments, it is comprised of fibrous (rope-like) material, and its primary function is controlling excessive movement of the knee by actually restricting the overall mobility of the joint. The medial collateral ligament stretches from the bottom of the thigh bone, also known as the femur, to the top of the shin bone (tibia). It is situated on the inner aspect of the knee restricting the widening of the interior of the knee joint. In other words, it keeps the knee from “opening-up” too much. Since the MCL restricts the widening of the joint interior, this ligament is often damaged when the outer portion of the knee is hit. If the knee is struck with sufficient force, the outer portion of the knee joint will buckle while the inner part widens. When this ligament overstretches, it becomes especially prone to injuries or tears. 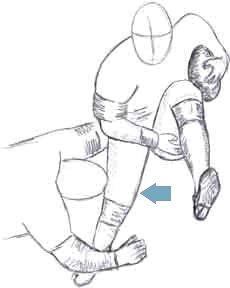 Football players are particularly susceptible to sustaining this type of ligament damage as a result of the rough contact nature of their sport. A medial collateral ligament tear can occur as a single injury to the knee joint or it can be involved in a more complex multiple knee joint injury. Other ligaments of the knee, specifically the ACL (anterior cruciate ligament) and the meniscus (rubber-like disc that cushions the knee joint), can accompany a tear to the MCL. Common symptoms include pain situated directly over the top of the ligament. Ligament swelling, bruising, and generalized swelling of the knee joint are quite common beginning one or two days after the injury takes place. In more severe instances of MCL injuries, patients often complain of knee instability. 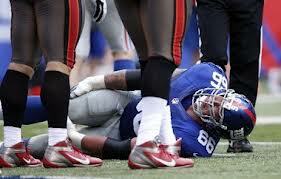 They say that the damaged knee could “give out.” In other words, the knee could buckle underneath them. MCL injuries are generally graded on a scale from one to three, based on the severity of the reported symptoms. slightly. The majority of athletes who sustain a Grade 1 tear only have to sit on the sidelines for a period of one to two weeks. Grade Two MCL Tear – Also known as a partial ligament tear, a Grade 2 tear stretches the injured ligament to the extent that it actually becomes loosened. Athletes who sustain this type of injury often report a feeling of instability when they try to perform cutting and/or pivoting moves. Accompanying swelling and pain are more significant. Typically, resting of the knee joint is necessary for three to four weeks following the injury. Grade Three MCL Tear – Commonly referred to as a complete ligament tear, the damaged knee ligament actually splits into two portions leaving the knee joint in a state of considerable instability. Patients suffer from severe pain and swelling, as well as increased problems with bending of the joint. Generally, a knee brace is worn to make the knee feel more comfortable. Complete healing can take as long as ten to twelve weeks. 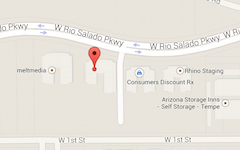 To a great extent, treatment with a Phoenix orthopedic surgeon depends on injury severity. 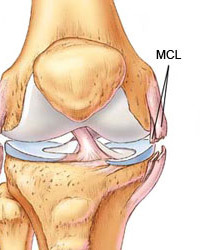 Treatment for a MCL tear initially focuses on letting the associated pain/swelling subside with rest, elevation, and icing. Then, it progresses to working on joint mobility followed by knee joint strengthening in order for the patient to gradually resume normal everyday activities and sports. Many times, bracing of the knee proves to be beneficial. The majority of this type of ligament tear does not require surgical intervention with a knee surgeon.